Register Log In ECN Forum Forums Violation Photo Forum What's Wrong Here? What New (2002 NEC) and existing rules are being violated here? Hello from Wharton, TX. I must admit to being nervous about this being my first post. I have been looking at ECN for some time now and have found it fascinating. Unfortunately, I am not in the electrical profession (I am an Audio Visual Coordinator at a local Community College), but I am very interested in this field and have learned a lot from this website. Regarding the photo, and not knowing any more than I do, the first problem that seems to stick out in my mind are the two white wires under the single lug, which I know is a violation. What is curious is the fact that this was unnecessary, given the large number of empty lugs nearby. The new 2002 NEC rule is 408.21 Grounded Conductor Terminations. Exception: Grounded conductors of circuits with parallel conductors shall be permitted to terminate in a single terminal if the terminal is identified for connection of more than one conductor. What's the busbar on the right with no connections to it? Is it just an extra neutral bar? That looks like another Neutral bar. It's the one that a thoughtful Electrician would have used first Filling the upper bar often blocks or makes terminating more difficult on the lower one when things start getting crowded. I thought it most likely was another neutral bar. We just seldom have two separate neutral busbars in panels here, unless it's a split panel with different mains. The two larger neutrals look as though they were installed after the smaller ones. On both bars the unused terminals are in their factory positions, except for the bottom terminal on the left. It has been backed out as though the electrician planned to use it, but then didn't for some reason. I suspect that the larger neutral which is doubled up with the small one was trimmed off too short to reach any of the higher terminals, and that there is something wrong with the bottom left terminal, stripped perhaps. Those aluminum neutral bars aren't the greatest. The electrician should have tied it to the bar on the right, but that would have been a little awkward given that the other neutrals were already installed on the left bar. When I make up a Panel with stacked Buses for the Grounded Conductors [such as this Panel - which looks like a Square D NQOx type Panel to me..], I will land the Conductors on the other Bus, just to keep the "First" Bus available for the next guy. Quite the opposite of what is shown in this image. That way, the Conductors can be landed without having to weave them under the first Bus, plus it just seems like a nice thing to do. P.S. Unless someone is holding a gun to my head, I would not double-up conductors like this, when there's so many free landings available!!! Feel free to contribute anything you can - we all benifit from each other. I agree looks like a QO. The upper two bars are factory. The lower was added. Why? 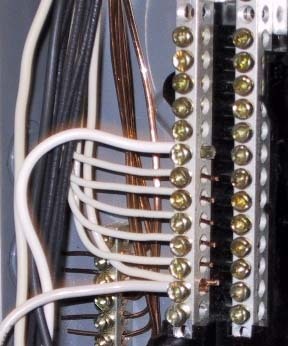 for future electricians and common sense.I come across this stuff all the time and its sometimes IMPOSSIBLE ti install the neutral in the proper place because there is an empty neutral bar covered with the original neutrals thus making it easier to double up the originals than try to get to the empty lugs.. The codebook should include this..